Sometimes, we web people can do some really funny pranks. This one’s an ingenious, instant classic. 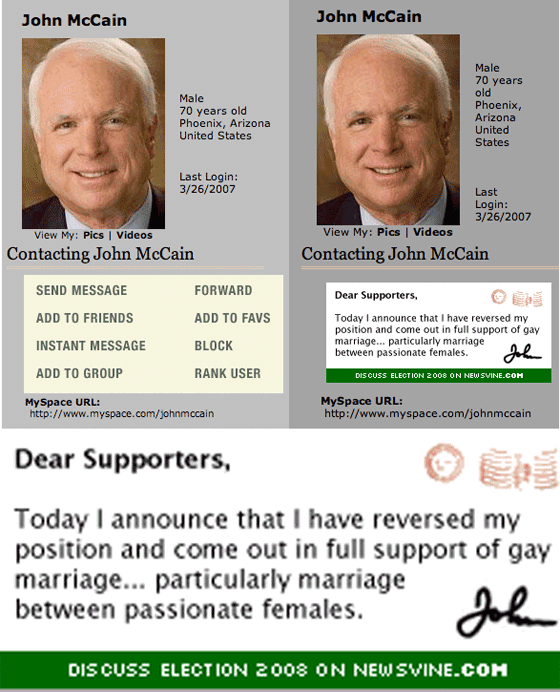 According to TechCrunch, John McCain’s staff used a “well-known template” to create his MySpace page, without paying for it. This happens all the time. Lesson: not only is hosting images remotely extremely rude, but it has some consequences when people get a little creative. ~ by Brad Levinson on March 27, 2007. To me this is sort of the bull in a china chop syndrome that plagues campaigns/companies participating in social networks. Participation without respect for the rules and culture of the community. Hi Todd! Absolutely — which is why the role of the “online sociologist/anthropologist” is going to play an increasingly important part in any successful campaign.